It’s December, and we all know that means: holiday celebrations are in full force. (And, we couldn’t be more thrilled.) 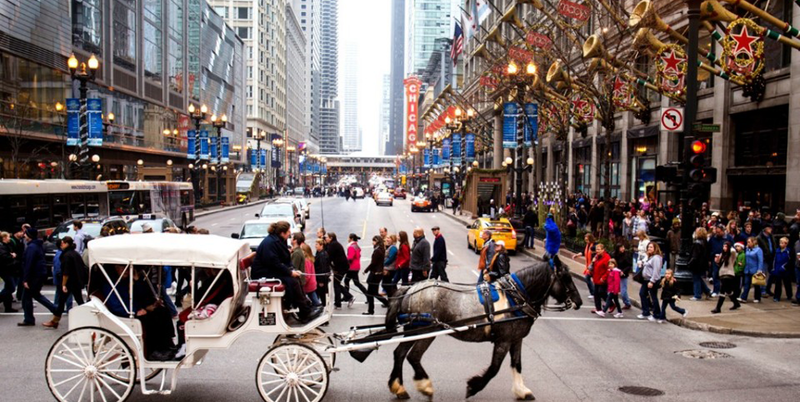 There’s no better destination to celebrate the holidays than in Chicago, as the city is always bursting with energy and excitement to keep those spirits high. Plus, there’s plenty to see and do for all ages, so whether you’re traveling with children or ringing in the year with friends, it’s easy to stock your schedule. Here are 4 ways to have some fun over the holidays in Chicago. Get in the holiday sprit with a few arcade games and carnival rides at Navy Pier’s WonderFest celebration, which will last until January 7th. Plus, it’s indoors—so you can stay nice and toasty, too. Between mini golf, a “snow tubing” hill, and ice-skating, it’s the perfect destination for families, as well as adults looking for some childhood fun. Just note: an adult must accompany anyone under the age of 18. With over 200 vendors all related to housewares, furniture, antiques, clothing, and more, this Randolph Street market lets you browse for some vintage, special pieces that make for perfect holiday gifts. What’s more, there’s also some delicious food—for when all that shopping works up an appetite. Plus, if you’re looking to get rid of some belongings (New Year’s cleansing, right? ), you can get them appraised on the spot. Be sure to mark your calendars for December 16-17th weekend. With so many fantastic shows and performances in Chicago during the holiday season, you’ll want to see a couple. (It’s hard to just pick one!) A few to note: Joffrey Ballet’s “The Nutcracker,” running throughout December, Charles Dickens’ “A Christmas Carol,” running until December 23rd, “It’s A Wonderful Life,” running until December 23rd, and “42nd Street,” which airs until January 7th. There’s so much to experience within this month, musically, and it’d be a shame to let the opportunity go to waste! Book a ticket now. Need a place to stay when visiting Chicago? Book your reservation now.